Does Dr. Scholl's Custom Fit Footmapping Machine Work? Dr. Scholl's now has kiosks in stores so you can have a machine recommend the correct custom insoles for your shoes. What you do is take your shoes off and stand on the platform. The machines are located primarily in select Wal-Mart stores and CVS pharmacies. This machine will take readings of your feet and how you stand. It will identify any problems (such as over- or under-pronation) to make a recommendation for you. The orthotic recommendation will let you know which of the products on display will suit your needs best. Orthotics help correct problems related to your feet. If you are flat-footed, it is likely you "over-pronate" which means you need added support in the arch area. This does not mean you need a high-arched shoe, but the opposite. You need support and resistance to prevent rolling your foot in the wrong direction. People who "under-pronate" have high arches and roll their ankles outward. 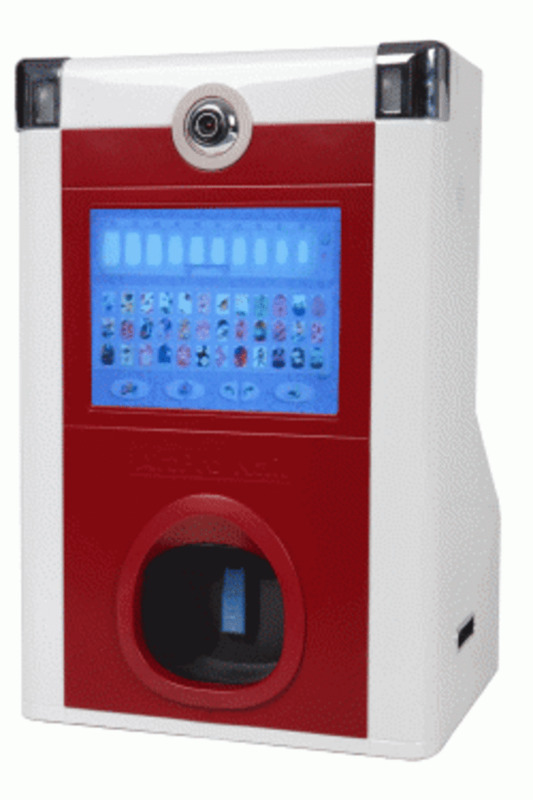 This new innovative machine is designed for public easy access to custom products. Normally, these machines require the assistance of a sales associate in better running shoe stores. Custom orthtotics can replace your current insoles. This site was started for people to post their experiences with products for other shoppers. As a customer myself, I often research products online and like to hear what other people say about it. This site is not affiliated with Dr. Scholl's. Dr. Scholls site for locations of these machines in the United States. You will see a box in the right-hand corner to search by zip code. Many of them are located in Wal-Mart stores in the pharmacy area. These machines include displays with products in each store. For Canadian locations try Dr. Scholl's Canada. The orthotic styles have numbers and the low number is for high arches and the highest number is for people with flat feet and need the most pronation control. I don't think this machine will tell you if you don't need an extra orthotic for support. It would never hurt you to have it especially if you are on your feet all day, so it appears they have models for people with neutral foot positions as well. It must be selling well; I saw a few of the orthotics were out of stock already. The cost of orthotics at the station is $50 and there are 14 different support types. 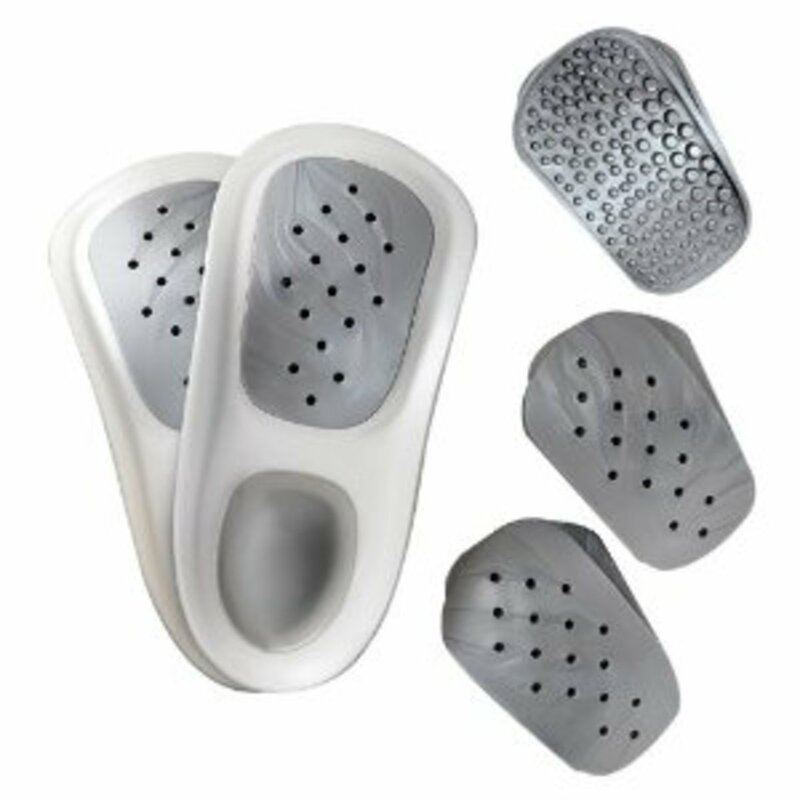 It may seem like a lot compared to other Dr. Scholl's products, but is significantly less expensive than other custom orthotics. You can get custom orthotics from a doctor or service for $200 to $500 and they are personalized for your individual feet. These reasonably-priced alternatives do work for many people and if you have concerns about your needs, check with your doctor. 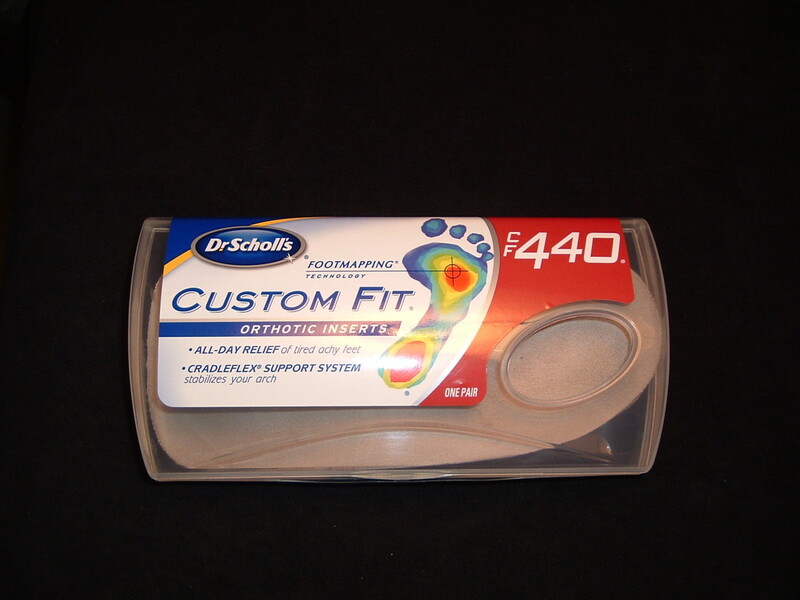 If you are not interested in custom orthotics are just looking for basic cushion or support, Dr. Scholl's makes several lines of insoles. These can be cut to size for your exact shoe and come in men's or women's. Types include: Back Pain Relief, Tri-Comfort, Adjustable Arch pain relief and many more. These can be less then $20 and good if you need insoles for only one pair of shoes. Insoles can be a good way to get more miles out of running shoes, also. Many running shoes you think need replacing may just need new insoles. Other orthotics in local retail locations include The Walking Company with over 200 retail locations and prices ranging from $44.95 to $79.95 for premium quality products with six-month warranties. If you have continuing knee of foot problems or require durable and serious support then I would recommend shopping around better shoe retail stores like The Walking Company or even medical supply stores whose inventory include several sizes and styles. Sometimes custom orthotics from a doctor's office are the most expensive option, but are a positive solution for individuals with back or spine misalignment or those with support needs a store brand can't satisfy. I have heard from people who have made a purchase that the insoles need to be worn a couple of times a week and take some breaking-in. Check the return policy of the store when you make the purchase but give them a chance to break in if they are uncomfortable for you. Also, wear them as a replacement insole to your current shoe instead of placing them on top of your current insoles. If you have flat feet or high arches there are some types of shoes you should avoid. Filp flops, the incorrect type of athletic shoes and high heels may not be appropriate for your feet. If you have a flat foot I would advise finding an athletic shoe designed for 'stability'. Those with high arches need cushion. I sold running shoes for a couple of years and the type of shoe you wear can make or break your athletic performance or just hurt your feet and knees in general. If you want to continue learning, please visit my shoe guide. If you are on your feet during the day and need the additional support, wearing a supportive athletic shoe if perfectly fine even if you are not participating in athletic activities. I just bought and wore orthotics by The Walking Company and love the support and quality for store-bought orthoics. Check out my review on these too if you are looking for a good full-length pair for walking, running, or dress. WalkFit Platinum Orthotics Review: Are They A Scam? What if you live in a rural town with no machine? is there a way to figure out which size to order? Is there a Kiosk that is not in a Walmart? I live in Tucson, Arizona and I cannot seem to find one. Used the machine today to see if I could get some relief for what I believed to be plantar faciatis and cannot believe the difference the insoles made just putting them into my shoes and walking out of the store (not limping as I had been going in). Amazing. This is my 5th pair. 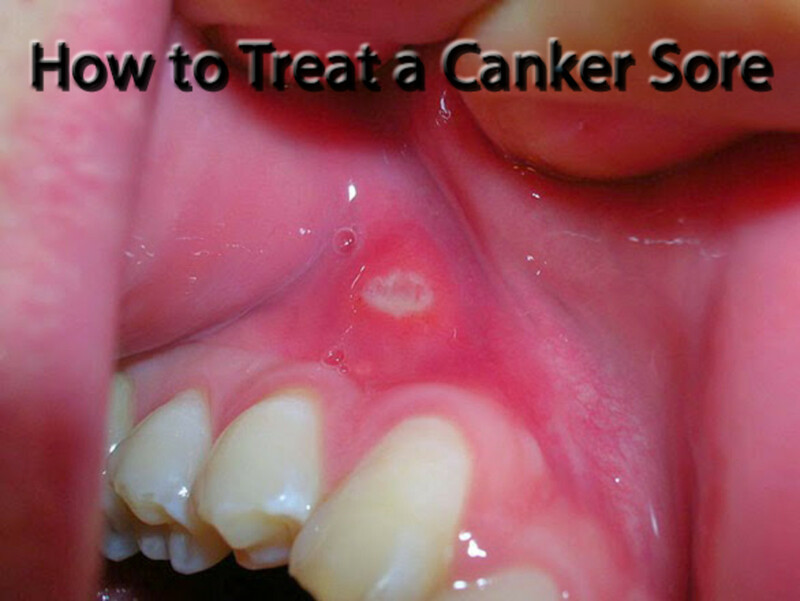 I have had 2 surgeries due to Acute Capulitis. Feet inflammed and swelling and pain. 5 years now and tried everything including the custom made @200.00 a pair form the orthopedic podiatrist. I am part time in a wheelchair and when I bought these (cf-310) I haven't had to use the wheelchair. Dr.Scholl's gave me my life back. I am not 100 percent pain free but my pain was 10 and now 1 to 2 :-) I am trully grateful to Dr.Scholl's and saving money by not buying the custom one's from the podiatrist. I had a swollen Achilles tendon and my doctor gave me a one week off and order an X-ray been done on my left foot. I was given 800 mg of Ibuprofen to take 3 times a day and the swelling were gone but not the pain after resting for 7 days. X-ray results did say just Mild Osteophytosis or bone spurs. I am supposed to work the next day even though I am still with pain and still limping when walking. I tried the Dr Scholls Footmapping custom fit orthotic device and it gave me CF330. I bought it and was skeptical at first. I place them in both sole of my dress shoes and slid both my feet. That is the most wonderful feeling I had, not having any pain and walking normally. It is the first day yet so I would give another feedback after a week or two. I received an injury to my foot several years ago that has caused continuous problems including a severe sharp pain. I purchased the Custom Fit Orthotics a year ago and will be buying a new pair in a little while because they worked amazing. I bought 420 a year ago. How long do they last before you need a new pair? I just re-tested and the machine recommended 320. Now I don't know which I need. What is the difference between 420 and 320? i went to a foot specialist about a year ago, he said i had very high arches. I went to a local store and stood on the foot mapping machine. I had three different result and only one said i had high arches. It was disappointing i was counting on these to work. I am starting a factory job and already i can barley walk from a eight hour job. I purchased the insole anyways and it didn't do anything to help my body. i don't recommend anyone to buy insole from the machine. ll see, it's for my plantar fasciitis anyway. love the pro arthritis inserts! immediate relief from hip and knee pain.. I just purchased a pair, yesterday. I have low arches and the inserts feel good in my shoes. I have a job where I stand, all day, and about 4 hours or so, in my arches were killing me. Does anyone know how long it will be until my feet are used to them?? I know there is a break in period...just wondering about how long it would be. As I go back to my new job, Monday. Other than that, I feel good. My back and knees aren't bothering me like they did the day before I bought these. I am impressed, so far. went to a walmart in west berlin, nj - tried the machine 3X and each time I received a different support number - needless to say, I left without buying anything! I purchased a pair of Dr Scholls Footmapping custom fit orthotic inserts at my Wallmart here in Palm Coast FL. They are not what I expected and I would like to return them. Your instructions say send upc code along with receipt. Don't you want the inserts also? Please advize. I would like to know what do I need to fit inside my shoes because they are too big. I got to tell you i had pain in the back of my ankle that got so bad i could hardly walk. I Went to a Kiosk in NJ and it said i had normal arches with a high degree of pressure and recommended CF340. I have been using them for just about a week now and the difference is absolutely amazing. All the pain in my ankles is gone, i will never wear shoes without them again. Under "Customer Comments and Returns," it says "Also, wear as a replacement insole to your current shoe instead of placing on top of your current insoles or remove the insoles that came with your shoes." Are you suppose to wear the Dr Scholl's under the soul or on top of your souls ? Do you take your inserts out of your shoes or put Dr.
Scholls Custom fit on top . Hi there- Was just wondering you had a chance to read my previous comment? Thanks! Is there a location near San francisco that I can try out this machine? I've always had flat and they cause me to have shin splints! This limits my ability to run. couldnt wait to get these.As soon as I put them on it was a relief.Starting having trouble with my knee.Got so bad I had to get a brace after 1 week.Leg and knee killing me.Took those out of shoes and pain in knee and leg gone.definately didnt work for me..
Im trying to find a kiosk near me, but site on web will not let me spell my city correctly. I have fasciitis plantar. my city is san bernardino california zip 92404. I'm on foot and taking the bus. Are there footmapping Machines in Local Stores across Alberta? Just bought a pair at Costco yesterday. I've heard that Walmart and other places sell 1 pair for about $50, well Costco sells them for about $64 for TWO pairs. I've been wearing them all day and they are quite comfy. I wasn't sure if I was supposed to directly place them in my shoe or take out my shoe's liner, so I just stuck them in. 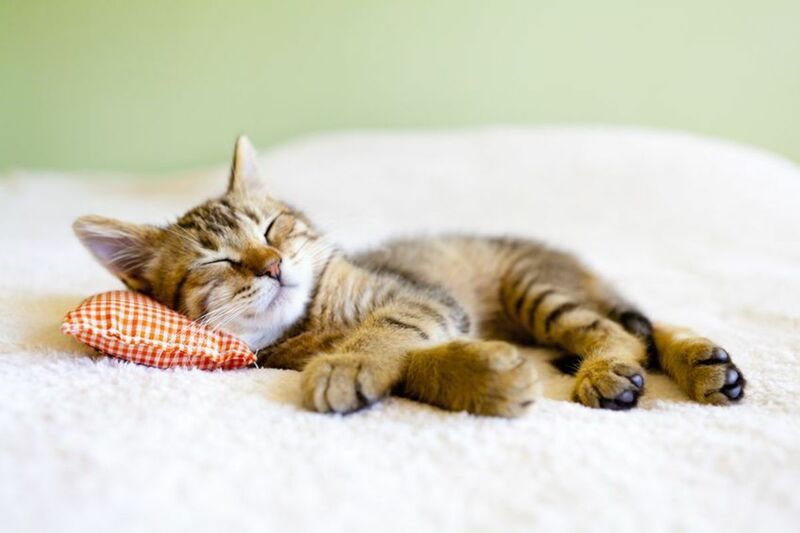 Immediate comfort. Tried the machine - said I needed cf440's, so I got a pair. So far after a few days I see big improvement. I have seen some other websites where some podiatrists (or people claiming to be podiatrists) seem to have an ax to grind against all Dr Scholls porducts. One in particular was a big advocate of Powerstep orthotics (actually considerably cheaper at around $20) as the best over the counter orthotic. I'm not sure what their issue is with Dr Scholls, but so far I am pleasantly surprised at how well these seem to be working. Based on comments here, I'm going to my local Walmart to get a pair. I got $500 orthotics 3 yrs. ago & they're no longer helping. I wear them in New Balance shoes. Orthopedist said never to go barefoot - he recommends Crocs for wearing around the house. I need to get back to doing that too. Thanks for all the help. Where in Canada, Ontario, Tornto you have de machine? I didn't expect much from this kiosk. I have always had very flat feet and have worn custom or OTC inserts for most of my life. When I used this kiosk, it reminded me to take off my shoes even though I had already done so - no big surpise considering that the outline of my bare feet have NO visible arches. My Walmart is always out of the CF 440s, but I found a set in another town and have worn them for about two weeks. Considering that a recent set of $150 inserts left me with debilitating knee pain, I can't recommend these highly enough for a $50 OTC product. I had my doubts about $50 prefab inserts, especially since I have never worn half-length inserts before, but these really worked for me. I tried one of these machines. It was a total waste of time. It said I have flat feet when, in fact, I have a very high arch and instep. Enter postal code to find the kiosk near you... they are usually in selected Superstore or Costco. used the machine twice in a row and got the same reading. bought the insoles and my feet feel so much better. I was limping prior to this purchase. I need addresses for the kiosk in toronto as I purchase mine in new york state. How often do we need to replace these inserts. It does not say on the product. Niagara region has one machine in St. Catharines. It's located in COSTCO. You must have a membership to shop there. It's like locating Tampax/Kotex dispensing mashine in Mens washroom. Not very good idea. I just began working 60 hour weeks on cement floors. After three 13 hour days in a row, I was in so much pain that I was in tears. I tried just buying the normal Dr. Scholl's sole replacements and my feet were just as painful after the next 13 hour work day. So, I hobbled back into Walmart and found the custom fit machine. It was easy to use and amazingly showed the pressure points clearly (exactly where I was feeling the pain. I have plantar fascitis and high arches. I am a CF130. My feet hurt now but it is from the damage that was done before. I feel instant relief while wearing the inserts. It is worth the fifty dollars! I am now a customer for life. I bought my first pair of the Dr. Scholls Orthotics at Walmart, near the Pharmacy Dept. going on 9 months ago. They are just now showing signs of wear, in that I am having leg and foot pain again. I work as a cook, in a large buffet, and am running all day or half the night at times. These orthotics saved my life. I would come home crying from foot pain before I bought them. I am getting a new pair very soon! I have also found them in a local grocery store recently, but they seem to always be near the Pharmacy wherever I have seen them. I tried the machine and it was rubbish. Having had problems diagnosed with fallen arches and plantar fascitis, I was enthusiastic about getting something recommended. The machine didn't even pick up that I had any problems and indicated my feet were normal. Really disappointed with it. There is obviously nothing like a skilled human being checking your feet out. Is there a Dr. Shcoll's footmapping machine in windsor,ont?? I was in the orthotic business for 20 years ('85 to 2005) and have worn orthotics for 37 years. In spite of this, both my knees have end stage arthritis and I could not walk without orthotics in all my shoes or using footbed sandals ...and definitely not in bare feet. In a quest to learn why my knees are so bad, I learned that bracing your foot with an orthotic causes the foot and leg muscles to atrophy, placing undue stress on the knees. Four months ago a friend suggested that I try Barefoot Science insoles. They are the anti-orthotic as they promote foot rehabilitation vs bracing; strengthening vs accommodation; 21st century science vs 1960's science. I've been wearing them for 4 months and the results are astounding. I can now stand and walk for much longer periods with less pain, I can walk barefoot and my shin splints that have plagued me for 30 years disappeared after 5 weeks. I will never wear an orthotic again. The Barefoot Science Insoles are 10,000 times better and at $40 are 1/10 of what my last pair of orthotics cost. Orthotics should be a last resort for only severe foot disorders and malformations. With regard to the Dr. Scholl product, they are using smoke and mirrors to sell a glorified insole. Try the Barefoot Science insole for the same price. Had my first pair of Dr Scholl '440' for about a year and just replaced them. The $50 cost is nothing compared to the results that I experienced. Prior to using them, had real pain issues that resolved completely in about a month and a half. I was a skeptic initially, I have to admit but the product does work. These arches are the greatest thing! I was unable to walk up or down stairs and limped everywhere. My fallen arches were killing me. I never thought these arches would help, but to my total surprise, they cured me!! I bought two pairs and am going to buy another to wear in my house slippers. They saved me hundreds of dollars by not having a podiatrist have them made for me. I didn't find the machine accurate at all. My results indicated I had very low arches and recommended the 410 on one try, the 420 twice, and the 440 once. However, I have extremely HIGH arches, and plantar fasciitis (which I've had surgery for). The machine isn't able to read the difference between high food pressure and low arches. @a_tanvi - I am not a medical professional so I can not give advice on what kind of product you need. I also do not know if any websites to send you that have product in Inida. Wish I could be of help. I am in the US Navy, and I want to have my command if not the Navy to purchase a machine that measures my foot and tells me what is the right shoe for my foot (high, normal, or low arch) I found one on the base in Port Hueneme CA, and I run faster, stronger, and less injuries compare to the past (shin splints, ankle sprains, and wrong shoe for my feet). I need to know what machine can do that. I use motion control shoes for flat feet and it has benfitted me. I want to help all military people around the world. jmatwa@yahoo.com or brian.aviles@navy.mil...current command brian.aviles@me.navy.mil Can you help? I would like to know why there are no kiosks in my area. My e-mail address is imthnlypoppy@aol.com. Would anyone like to give me an answer? I went to two stores and was given two different insole types. I was measured for a 240 at one store and a 440 at another. At $49.95 a pair, I was relictant to by either. I have nueropathy and thought these could help. I've used Lynco inserts for years, fitted by a Walking Company machine. Life-changing and welcome after paying hundreds of $ for orthotics and doctor's care. One important tip: The doctor diagnosed plantar fasciitis and urged me never to go barefoot or wear non-orthotic footwear. To do so re-injures the foot. (He said he'd slip them on to go to the bathroom during the night) I took this advice to heart. I've gone from scarcely being able to walk to being able to hike! I tried the machine I need to get inserts due to spraining my planter fasciitis and the doctor told me I had high arches. When I tried the machine it said I have normal arhces so something must be wrong the machine or the doctor? I chose not to buy them because I didn't want the wrong ones. I love these inserts, I bought 2 for myself, gave one to my friend for her birthday gift and she loved it as well. We both have the same problem, plantar fasciitis due to high arches and being on our feet a lot, we are both nurses. The foot pain was instantly relieved on the first application. Now, where can I get a rebate for 3 pairs, can someone tell me please, thanks. I have size 13 feet that are so flat they make sucking noises when I walk barefoot across a tile floor. When I saw the ads for the Dr Scholl's self-service kiosk a few weeks ago, I immediately logged in and tried to find the one closest to me. Unfortunately, I encountered the web site problem described by so many others here. Note to Dr Scholl's: don't run a national advertising campaign until AFTER the referenced web site is working. They almost lost me as a customer because of this, since I gave up and almost forgot about it. However, I tried again yesterday, found that the web site was now working, and found that a Wal-Mart near me had a machine. Honestly, I feel like I've got clouds on my feet. No break-in period here. I don't want to take my shoes off, I feel like wearing the darn things to bed. Granted, it's only been one day. If I'm singing a different song a month from now, I'll update this review. But my initial recommendation is: If you have giant scuba flippers for feet like I do, give these a try. I just purchased them because I am in therapy for inflammation of my tendon in my left foot and I have flat feet. I did purchase them at Walmart. My question is I got the ones suggested, and it seems they don't fit in all of my shoes and my feet kind of slip off the back of the shoe with them in. I don't have anything additional in the shoes but to be honest, I don't feel anything great or different yet. though its expensive but i usually see a podiatrist to have my custom ortothic insert done its much accurate and better. I checked out the link and it does not look like the zip code search is working for me either. There must be something going on with the Dr. Scholl's site. I don't have the latest version of firefox so I am wondering if that might be the cause as well. @Yvette I posted the national chains where most people will find them. If you use the zip code search on the site (if it works :( ) then it will show you the locations. I did not include limited regional stores. Something seems messed up with the web site. I can't locate any kiosks anywhere, even near major U.S. cities. I see some of you are having problems--and my guess is you are probably putting the new orthotics into shoes that have been "worn" and are already worn and misshaped by your foot problem!! Then by placing the new orthotic in your "old worn shoes" ( which have been shaped to your foot problem)--it could be a real disaster! No wonder some of you are having problems. By putting the orthotics into old worn down shoes you are screwing up the new device. It's probably like trying to walk on rubber balls! Best to use "new" shoes with the new orthotics--and best to remove the interior "lining" of the shoe, then put the new orthotic in it. I have had prescription orthotics for my feet for years--but my insurance only covers part of the cost once a year. I decided to give the Dr Scholl's product a "try" since I find it time consumming to change my orthotics every time I want to wear a different shoe. Voila!!! These are MARVELOUS!!! Mind you--in the past, I have tried putting orthotics in some old worn shoes--and it doesn't work! Also--sometimes orthotics just don't feel "right" in certain shoes. When you buy new shoes at the store--you obviously can't rip out the interior when you buy them! You take a chance ( I suppose) if you get shoes--and rip out the interior only to find it's not going to "work". I'm very careful about what shoes I buy so I can get my orthotics to fit in them. Sometimes,I even leave the interior of the shoes in the shoes if it feels "right"!!!! I don't like putting them in shoes that have all kinds of linings with "shapes" designed for everyone. The orthotics fit best when the interior ( lining) is fairly "flat"--and let the new orthotic do the work designed for your foot! I love how they fit in some of my sandals. I had given up wearing sandals because my feet hurt sooooo bad!! So my advice is--- it's a great invention--but don't expect miracles if you put them in old shoes--or put into the shoes incorrectly!!!!! The insoles are sold at london drugs and superstore as well, do your research. They are actually NOT at walmart where I live. But I have no problem with walmart. Also, 50 bucks for some relief is better than nothing. I don't have a plan where I can purchase 300 dollar insoles so until I can, these will do. People that think they will solve all their problems and be as good as a 3D mapping will obviously be disappointed. 50 dollars is cheap for insoles that are "somewhat" custom fit. I haven't purchased them yet, but I will be this evening. Heads up: Get the $10 rebate on Dr. Scholl's website. Also, at Meijer, I even used the $2 coupon off that was supposed to be used on the "Pain Relief" inserts. It's also on Dr. Scholl's website. I just bought them today (CF120). It said I had average arches, which was a shock, because they seem very high to me. I went to the podiatrist two weeks ago for plantar fasciitis. His only advice was to stretch my feet and get decent walking shoes. I agree with Mare,... I am intrigued.,,even though I already have a pair of orthotics but all the locations in a 25 miles are Wal-mart stores which I for fair labor/ trade reasons will not step foot in. I saw some CVS locations but they are very far away. After reading some of the negative comments I don't feel so anxious to take the long drive to try it out. Was at Wal-Mart and the machine recommanded the "right" insert for me. I wore them for a few hours at a time, daily and felt little change at first. I am a waitress. After about 2 months my left leg, knee and foot had swelling and pain. I was considering a visit to the doctor as the symtoms had me worried. I held off with the doctors visit, as the family took a vacation and my shoes with the inserts were left at home. My left leg swelling and pains greatly improved. The next scheduled waitressing shift I put on the shoes with inserts and had strong pain after taking two steps.!!! I live in Toronto, is there a machine location somewhere? I bought a pair of the inserts. The insoles did not help my feet. I sent the information back to the company for a refund. I have a rightclub foot low arch highfoot pressure I brought the CF440 and it works for me I am on my feet 8hrs. aday. Great website and information. Thanks for sharing! I LOVE these. My left foot is so flat that my ankle bone nearly touches the floor. Walking caused severe pain in my ankle (like a knife sticking in the ankle with every step). I purchased these the beginning of July 2010 and have worn them almost everyday since then. When I slip on flip-flops to walk around the house, the severe pain returns. I'm so happy to have found these. I used the machine and it was quite simple. The price looks shocking at first, but is not bad being that you can pay up to 200 for pediactric help that could turn the same results. I just wonder about people like myelf that have had medical issues with feet or ankles in the past. I had a sprain years ago and still have issues with that foot and finding shoes that fit. I plan on buying a pair this weekend so I will wear them a week or so and let you all know. I work 60 plus hours a week on my feet. 50 bucks may be well worth it. I just bought these inserts (C420) two days ago on July 30, 2010, and absolutely love them. My feet have always been a problem since I was a child wearing Buster Brown shoes for flat feet. Have already done two hikes with them in my running shoes and have absolutely no complaints. A lot cheaper than going to a podiatrist for inserts. Thumbs up!! I think it is a HUGE rip off that the only places you can find these are at a WalMart. They are evil and I don't go there. ps: I also ignore comments from people who can't type or spell correctly.